The U.S. State Department has said statements made by Ukraine's Prosecutor General Yuriy Lutsenko about the U.S. Ambassador to Ukraine Marie Yovanovitch giving him a list of persons "not-to-prosecute" is inaccurate and is intended to besmirch the reputation of Ambassador Yovanovitch. Ambassador Yovanovitch represents the U.S. president here in Ukraine, and America supports the ambassador and her statements. The statement by Ukraine's Prosecutor General is inaccurate and is intended to besmirch the reputation of Ambassador Yovanovitch. 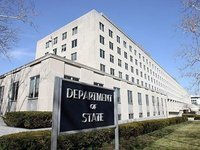 Such accusations help only corrupt officials, an unnamed State Department official said in response written in Ukrainian to questions from the Kyiv-based Interfax-Ukraine news agency. The State Department said Ukraine, like the United States, is a free country with a free press and …. politicians, experts and media have the right to share their opinions, which is part of the democratic process …. but this does not mean these statements are accurate. Such attacks double our resolve to help Ukraine win in the war against corruption, the unnamed U.S. State Department official said. American diplomats said the United States had always emphasized the necessity of carrying out deep, multifaceted and timely reforms, which correspond with the demands of the Ukrainian people, who made them during the Revolution of Dignity. They included, namely, ending the system of corruption, quickening economic growth and a European future for all Ukrainians. We have consistently said that Ukraine's long-term success and resilience depends on dedication to the course of reforms, in particular the battle against corruption. In order to achieve success, Ukraine needs committed officials and anti-corruption institutions. The United States is committed to cooperating with our partners in Ukraine, including in efforts to battle corruption, which continues to pose a threat to Ukraine's national security, its national wellbeing and democratic development, the unnamed State Department official said, adding that in the absence of political will by Ukraine, for example, from the Prosecutor General's Office (PGO), the American diplomats fulfill their responsibilities and transfer assistance funds where they can bring positive changes. As reported, Lutsenko earlier gave an interview to the Washington D.C.-based The Hill publication, saying Yovanovitch gave him a "not-to-prosecute" list of persons. Lutsenko during his interview may have had ex-Deputy PGO Chief David Sakvarelidze in mind when speaking about Yovanovitch and the investigation about the use of U.S. taxpayer funds earmarked for reforming Ukraine's PGO. In 2016, ex-Chargé d'Affaires in Ukraine George Kent sent a letter to Deputy PGO chief Yuriy Stoliarchuk asking to close the investigation into the embezzlement of U.S. funds by Sakvarelidze.